● ● ● ● ● ● ● ● ● trends FE&S reports on the hottest trends in tabletop design, concept development and other areas of the foodservice industry — both at the back and front of the house. 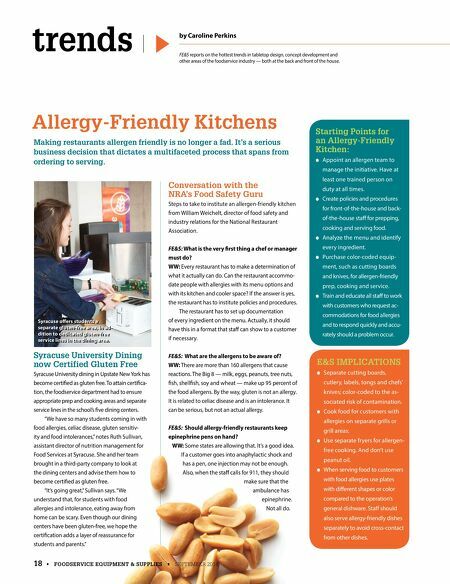 by Caroline Perkins Allergy-Friendly Kitchens 18 • FOODSERVICE EQUIPMENT & SUPPLIES • SEPTEMBER 2018 Making restaurants allergen friendly is no longer a fad. It's a serious business decision that dictates a multifaceted process that spans from ordering to serving. Starting Points for an Allergy-Friendly Kitchen: ● Appoint an allergen team to manage the initiative. Have at least one trained person on duty at all times. ● Create policies and procedures for front-of-the-house and back- of-the-house staff for prepping, cooking and serving food. ● Analyze the menu and identify every ingredient. 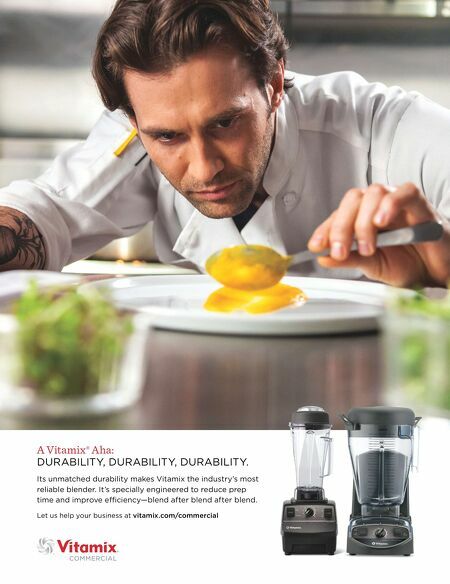 ● Purchase color-coded equip- ment, such as cutting boards and knives, for allergen-friendly prep, cooking and service. ● Train and educate all staff to work with customers who request ac- commodations for food allergies and to respond quickly and accu- rately should a problem occur. E&S IMPLICATIONS ● Separate cutting boards, cutlery, labels, tongs and chefs' knives; color-coded to the as- sociated risk of contamination. ● Cook food for customers with allergies on separate grills or grill areas. ● Use separate fryers for allergen- free cooking. And don't use peanut oil. ● When serving food to customers with food allergies use plates with different shapes or color compared to the operation's general dishware. Staff should also serve allergy-friendly dishes separately to avoid cross-contact from other dishes. Syracuse University Dining now Certified Gluten Free Syracuse University dining in Upstate New York has become certified as gluten free. To attain certifica- tion, the foodservice department had to ensure appropriate prep and cooking areas and separate service lines in the school's five dining centers. "We have so many students coming in with food allergies, celiac disease, gluten sensitiv- ity and food intolerances," notes Ruth Sullivan, assistant director of nutrition management for Food Services at Syracuse. She and her team brought in a third-party company to look at the dining centers and advise them how to become certified as gluten free. "It's going great," Sullivan says. "We understand that, for students with food allergies and intolerance, eating away from home can be scary. Even though our dining centers have been gluten-free, we hope the certification adds a layer of reassurance for students and parents." Conversation with the NRA's Food Safety Guru Steps to take to institute an allergen-friendly kitchen from William Weichelt, director of food safety and industry relations for the National Restaurant Association. FE&S: What is the very first thing a chef or manager must do? WW: Every restaurant has to make a determination of what it actually can do. Can the restaurant accommo- date people with allergies with its menu options and with its kitchen and cooler space? If the answer is yes, the restaurant has to institute policies and procedures. The restaurant has to set up documentation of every ingredient on the menu. Actually, it should have this in a format that staff can show to a customer if necessary. FE&S: What are the allergens to be aware of? WW: There are more than 160 allergens that cause reactions. The Big 8 — milk, eggs, peanuts, tree nuts, fish, shellfish, soy and wheat — make up 95 percent of the food allergens. By the way, gluten is not an allergy. It is related to celiac disease and is an intolerance. It can be serious, but not an actual allergy. FE&S: Should allergy-friendly restaurants keep epinephrine pens on hand? WW: Some states are allowing that. It's a good idea. If a customer goes into anaphylactic shock and has a pen, one injection may not be enough. Also, when the staff calls for 911, they should make sure that the ambulance has epinephrine. Not all do. Syracuse offers students a separate gluten-free area, in ad- dition to dedicated gluten-free service lines in the dining area.